A delicious beefy smelling smoke is wafting from our grill. It’s springtime in South Dakota and that means the grill has been uncovered for the warm sunshine days that are beginning to greet us. I would like to say I grilled all through this year’s winter but that wasn’t the case this time ‘round as it was generally covered in 6-8 inches of snow at all times. Which made the first spring morning I got to grill breakfast on it that much more special, and oh so good tasting. Thanks to a local grocery store having a mega meat sale our freezer is primed for grilling season. In addition to our home-raised beef, we now have shrimp, pork loins, chicken breasts and an abundant supply of bacon. Because we all know bacon wrapped anything cooked on the grill is delicious. 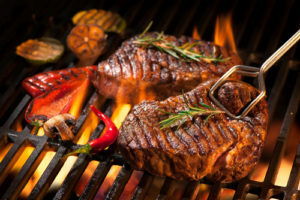 I visited the local library and scrounged through their free magazines to bring home a few new grilling recipes that should be fun to try this summer season as well. If you recall, I asked for advice on cooking homemade pizza on the grill two summers ago, and while I got lots of solid advice from CBW readers, I still haven’t managed to pull off a pizza that I am proud of. I may have to invite some of you to my house to give me a demo! How are your summer calendars shaping up? Hopefully in amongst the cattle working days, haying, and routine farm chores you will find time to escape. Be it just a trip into town for the local county fair or a big family vacation to places unknown, I think either is beneficial to one’s mental health. So, make plans to go – somewhere! Next week will bring with it several important elections in our region. Governors, Secretary of Agricultures, state legislators, and county commissioners will be decided. Please read up on the candidates and show up at the polls to cast your vote.